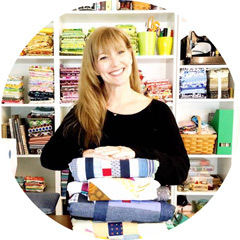 This is my story from yesterday, my PSA for all the sewers and quilters that do things a thousand times...come rain or shine...sometimes sleep deprived...sometimes just a bit distracted from kids or television ( do I hear Downton Abbey or Twilight in the background?) or deadlines that we place on ourselves ( Yes, Amy,Sara and Lisa...this includes YOU! )...I was the number one idiot!!!!! I waited around for quite a bit and had AMAZING support from my Facebook, Instagram and Twitter friends...I cried about that later too...I really am a VERY LUCKY girl!!!!! Now I am the owner of four stitches in my finger. My biggest disappointment is that I am not sewn up with Aurifil thread! I asked and they had NONE!!!!! WTH!?!? The bonus is that the PA that did my stitches gave me the scissors to bring home!!!!!! SCORE!!!!!! The bag cracks me up!!!! Today, being the planner that I am, I decided to figure out what color of Aurifil thread I am, order it and if I ever have this happen again, I am prone to accidents, I can go in prepared! Really, I can't sew and this seems like a fun thing to do, LOL! But I think it would be super fun to have these variegated threads as stitches!!!!! Please be careful in your sewing!!!!!! Oh Kim! So sorry this happened to you, and I have to be honest, I'm always worried about it happening to me too! I actually did cut my thumb pretty bad once, cut right through the nail & nail bed, but thankfully not to the point to need stitches. Hope you heal quickly & get back to sewing soon! I did that this past summer!!!! Eek! The nerves in my finger tip are still not healed! I now use a ruler handle and have mesh glove for safety!!!! Good times! I cut my thumb a while back. Mine was on an angle through my thumb nail. If I looked at my thumb from the side, it was flat instead of domed. Yuck! I did enjoy not doing dishes for a bit though! I also got away with not cooking for a bit, but the family was catching on that I was still sewing and doing other things! Kim that is horrible!! I dread doing the same thing. Very funny post though! 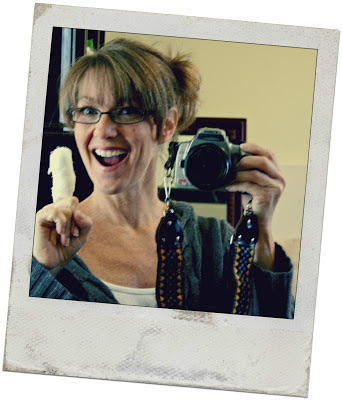 When I worked in the ER, I stitched up a number of fingers mauled by rotary cutters :-) The good side--not only did you get scissors, but you also got needle drivers and hemostats! They are WONDERFUL for sewing! Hope your finger feels better soon. Hilarious thread-finger comparison. Yes, go for the variegated! !OUCH! I know from experience it hurts...alot, however mine did not receive stitches (I'm a fraidy cat and just bandaged the sucker up)! now you can take a workshop from me as you got our cutting done on your own time.. wink! No accidents allowed in class! OW! Poor you! And thanks for the very graphic reminder! Get better soon! 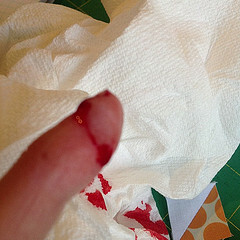 Sorry that you hurt yourself but that's the risk we take when we start the dangerous hobby of quilting. I love that you have your thread colour chosen for next time. I'm sure you have a needle you should have just sewn yourself up. I would definitely go for the multi, no. 4657, but you know it will turn grey anyway by the time you take them out! *lol* What a good sport you are, I'm so glad it wasn't worse! It all happens so fast!!! !Happy healing! OUCH! So sorry to hear you cut your finger ~ the good thing is that it will heal in no time and you'll be back to doing what you do so incredibly well! EEEK! That's a big price to pay for new scissors, but it reminds me of going to the dentist as a child and being able to pick a small prize from a box if I was good. Hope things heal quickly. I like the variegated choice!! Haha! I did the same thing about 3 weeks ago! I should have gotten stitches, but since I work in the OR I just grabbed some liquid surgical adhesive and "glued it closed!" I know have little feeling in the area that I cut, but it will come back. Hope you heal well and fast! I shouldn't have looked...made me cringe a bit! Didn't you do this before too? You poor soul. 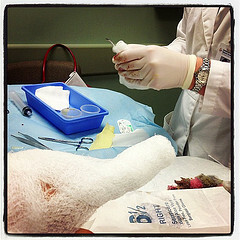 I'm so glad you didn't get hurt worse - we've all heard the horror stories! I hope the healing process is quick for you! YIKES!!!!!!! I've done this, but not so severely! How awesome that you have matching thread if this ever happens again! I am sorry that this has put your stitching on hold for a little while, but it did give you some free time to play with the Aurifil colour chart. You must be someone who can find a silver lining in every experience. In all seriousness I'm very sorry you injured yourself and hope you are back to sewing soon. Just read your post and it was a reminder how quick you can cut yourself with a rotary cutter! I love them, but they are dangerous. Just wanted to let you know that Fons & Porter has a glove you wear on your left hand while using a rotary cutter & you can't cut thru it. It's called a Klutz Glove. I have one & love it for this reason! OUCH......I feel your pain...and frustration too! Hope it will be back to normal SOON! !